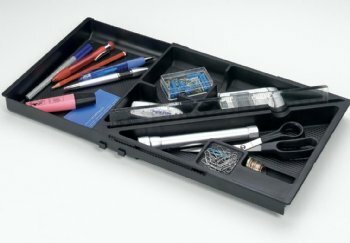 A clever patented adjustable pen tray with a ratchet design that bumps along to the width you need & suits 99% of drawer systems, including Metal & Wooden. Originally designed to get over the problem of pen trays intefering with drawer runners, the overhangs are able to be much smaller than normal pen trays because the ratchet system keeps the pentray stable and stops it from dropping into the drawer. It has an extra deep design with storage for media, coins, paper clips, rulers etc. and comes as standard in a couple of colours. There's also a recess in the front right for dealers & furniture manufacturers to apply a label if they want to brand the furniture they sell. Makes a great accessory for the home or office and we show standard colours & finishes where possible but these are constantly changing so if you require a colour not listed in the drop-down, speak to us as we may well have added it since. Seems to fit most drawers in desks. Certainly far better than previous non-adjustable one I purchased which kept falling off drawer sides. Excellent service......will certainly shop with you again. Was thicker than thought but a very sturdy and easy to use tray. Worth buying in pack of 15. Mechanism not particularly smooth BUT once you get the size you want you don't need it to move again!! We bought 30 in total and very pleased with them! Ruler holder very good, pity our drawers are very narrow as we don't get to use any of the extending part!! staff member is very happy with product and thought the adjustable feature was very handy as the drawer was quite large and not a standard size. A: There's a blue 'View Drawing' button on this product page, that you can click - which will give you all the dimensions you should need. Just sandwiched between the Add to Basket box and the Description.